$10 Credit For Your Local Deals! 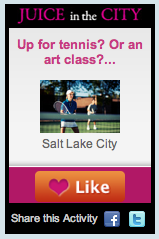 If your not in Utah you won't see it but you'll see either deals or activities in your area. If you do like the activity be sure to "Like" it so they will get a deal there in the future. Also they have a Facebook page that will keep you in the loop. THEN refer your friends and you'll get a $10 credit for each friend!! !